On Tuesday afternoon, I travelled to Manchester to see one of my favourite bands, The 1975. I was extremely excited about seeing them because I’d heard so many good things about their shows, and I had always wanted to see them live. They certainly didn’t disappoint. In fact, they exceeded my already high expectations; their show was literally out of this world. That’s the only way I could describe it, but I’m going to attempt to put my experience into words during this post even though just writing it down doesn’t seem to do it justice! We got to the arena after a good old Nando’s and found our seats in time for the support act. The only other time I’d been to the Manchester Arena I made the huge mistake of buying seats in the upper tier, little did I know the arena holds 25,000 people and goes extremely high up. For someone with a major fear of heights, this resulted in me literally crying (not even in internet speak, I was actually crying.) when I realised how high we were sitting. Fortunately I learned from my mistake and this time we were in the lower tier of seating and actually had an amazing view! Luckily there was only one support act to sit through, a band called The Japanese House, and they were… interesting. Their music wasn’t the kind of thing I’m into but they were decent enough, despite almost blinding me with their strobe lighting effects. 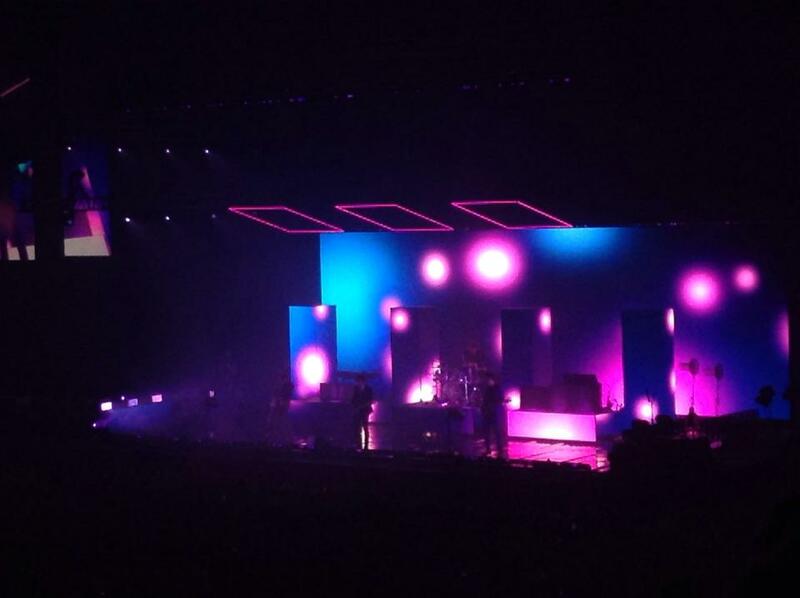 When The 1975 came on, they opened with ‘Love Me’, the first single from their most recent album. It’s such a quirky and fun song, so I thought it was a perfect choice to open the show with; it got everyone up and dancing from the very start and the energy in the arena was insane. Previously, The 1975 have only done tours in small venues, so this was their first arena tour and it felt so special to have been a part of their first arena show. The fact that this was their home show as well as they’re from Manchester made it even more amazing. 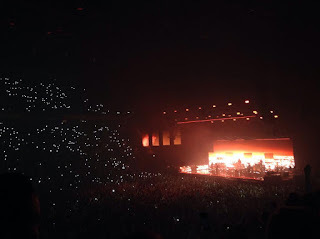 You could tell that they were so overwhelmed at the fact they had managed to sell out an arena that held 25,000 people; Matty the lead singer kept thanking us all the time for coming and making his dreams come true, it was so adorable. Their set had just the right mixture of old and new tracks, from my classic favourites ‘Robbers’ and ‘Girls’ to their most recent singles ‘A Change of Heart’ and ‘Somebody Else’. As I’ve already mentioned, the atmosphere and energy inside the arena was electric; it was honestly one of the best crowds I’ve ever been a part of. Everyone was constantly on their feet, jumping around and having the time of their lives which is my absolute favourite part of any concert. Also, aside from One Direction concerts of course because nothing can compare to them, it was one of the loudest and most hyped up crowds I’ve ever heard. In all the videos I took you can hear everyone singing along so loudly and I loved that, Matty kept holding out the microphone to the crowd and the power of the words being sung back was astounding. There was just such a positive, fun vibe which made me so happy. Despite the hyped up atmosphere, they also did an amazingly mellow instrumental section. This involved all the band playing their instruments, including the backing band, and Matty joining in on the keyboard and it was literally magical. 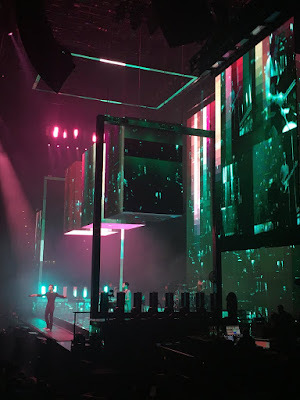 They played the title track from the newest album, ‘I Like it When you Sleep, for you are so Beautiful yet so Unaware of it’, and it was truly an enchanting spectacle to have witnessed. The only time I’ll usually listen to this chilled out instrumental track is when I’m doing something I need to concentrate on, such as work, writing etc, and I just want some quiet background music. However, when they played it live it gave the track a whole new dimension which blew me away. It was good to have a break from the crazy jumping around and just watch the band play their instruments so amazingly, it was unlike anything I’d seen before in any concert I’ve been to and I loved its originality and chilled vibe. I should also talk about the insane visuals throughout the show. The set and staging was in the literal sense of the word, awesome. As you can see from the photos, they had different images projected onto the screen behind them, but it also had a 3D effect due to the three rectangular prism-type things at the back of the stage. I know, so technical, but I don’t know how else to describe it! So during the different songs, there were varying visual effects on the screen, such as the sea, flashing lights, different colours, etc. Also of course there were three rectangles being lit up in various colours at the top of the stage, The 1975’s signature symbol. One of the most special moments of the show was when Matty spontaneously decided to add another song, ‘fallingforyou’ to the set list. He started talking about how in today’s society we tend to live our lives in a kind of ‘forum’, constantly having to tweet and snapchat and Instagram everything. So he asked for this one song if everyone could just put their phones away and enjoy the moment, as people together just living right then and there. It was honestly such an amazing idea, as like Matty said, we would have a more vivid memory of that song than you would ever get from a video on your phone. It was really weird to look around such a massive arena and not see one lit up screen or flash, just a sea of people with their arms in the air enjoying the music and the moment. It was truly beautiful and showed that sometimes you don’t need photographic evidence of something as long as the experience in your memory is special and meaningful to you. Another of my favourite moments of the show was Matty’s speech before ‘Loving Someone’. He talked, inevitably, about the US election as they were in America at the time it was going on. It seems like everyone you meet has something to say about Trump, yet instead of just cursing him and calling him out on all his mistakes, Matty gave a sensitive and insightful speech about how we need to respect others’ opinions if we are ever going to get ours listened to. Of course, he talked about how Brexit and Trump seem to be fuelling hate and negativity, but that we as a new generation growing up can make a change to the world as long as we do it respectfully. I thought this speech was so inspirational as it wasn’t just the average ‘I hate Donald Trump!! !’ rant, but it was intelligently worded and showed that in the end love will always win through. absolute favourite moments of a concert. It was just so magical, seeing such a big arena with all the lights twinkling and Matty’s amazing vocals singing an atmospheric and emotional song. After singing ‘If I Believe You’ and the classic ‘Chocolate’, they finished the show with ‘The Sound’. It was such an amazing final song choice, everyone went absolutely insane jumping around and giving it one last energy-fuelled blast before the concert was over. It was just like a massive party to finish together with the flashing lights, the crowd singing along at the top of their lungs and everyone having the time of their lives. It’s safe to say my voice, feet and ears were absolutely dead afterwards but it was so worth it! I can hands down say that this was one of the best concerts I’ve ever been to, just the energy, the vocals, the staging and how grateful and inspirational Matty was made it such an amazing experience. I am so happy I finally got to see The 1975 live, and now I can see why people rave about their shows so much.